The cross-pollination of disciplines, the boundary blurring between masculine and feminine, the blending of old and new, and the combination of fashion and craft are just a few examples of the creative contamination taking place in the world today. Visits to Heimtextil, Domotex, imm cologne, Maison&Objet, Paris Deco Off, and the Craft and Hobby Association Show held examples of these movements, all which can be found within the virtual pages of Trendease this month. This, and much, much more! Get inspired with the February edition! Frankfurt — It is an exciting time and it is a terrifying time. Some may call contamination a poisoning, corruption, or pollution of the status quo, but within its creative application, others see it as an opportunity to explore new horizons and break barriers. Technologies are advancing and lifestyles are shifting. Projects require more creative collaboration than ever before, tapping into diverse knowledge pools, generating never-before-imagined ideas and groundbreaking innovations. Paris — Home Observatory team has come up with the theme, ELSEWHERE, for the latest edition of Maison&Objet. Meant to reflect the up-to-the-minute tendencies, the sub-theme of Landscape is experienced more like a temporary exhibition at a museum than a pop up trend forum. Nature becomes the head designer, the meaning of design itself is questioned, and a surreal journey was had by all who walked through the rooms. Paris — To celebrate sun-worship that is this trend, François Bernard calls upon the traveling writers of the 20th century, the disenchanted eccentrics of the 50s, the future-telling magicians, and the peaceniks of the 70s to get the party started. Yellow is the color, hot is the climate, psychedelic is the atmosphere, and it is all balanced with the love of solitude and serenity. Paris — Walking into this installation is almost like being in the middle of a seapunk video. Seapunk is a subculture movement that picked up momentum in 2012. Visually the style can easily do your head in—neon colors, blue-greens, dolphin motifs, and rotating geometric shapes in contrasting colors—but it has gained traction with the youth market (some even claim the fad is over). Despite mixed opinions on the style, it still has a following. Cologne — At imm cologne Danish interior and product designer, Louise Campbell, envisioned and built Das Haus, a 240 square meter experimental and forward-thinking setup of a contemporary home. The living space is meant to be practical, authentic, and include home fashion trends as well as reflect current social changes. Has Campbell found the right measure between the masculine and feminine as hoped? 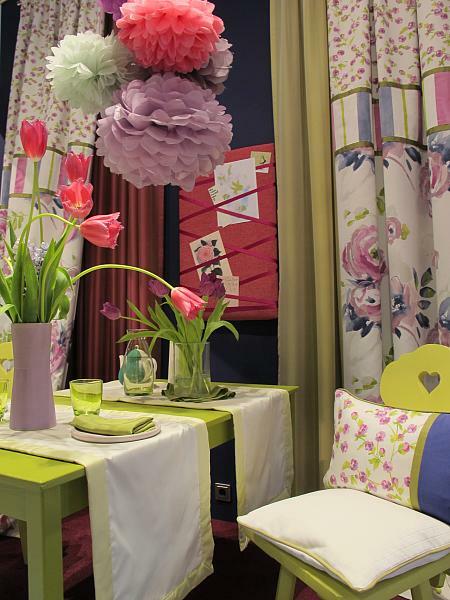 Cologne — This year, at the end of the new LivingInteriors “Trend Avenue” one came upon “The Rooms”. The 2014 theme was “Oases in urban deserts”, a direction that means to demonstrate how a desire for “green” versus “grey” can be interpreted in city apartments. The focus was on flooring, bathroom fittings, wallcoverings, and lighting. Also within learn the trend highlights from imm cologne. Hannover — On 1st Rug Avenue, during Domotex, eight homes in this stylized “suburb” are surrounded by white picket fences and open on one side for all to see. Although each white house looks the same from the exterior, within diverse stories are told through interior design—from a noble pallor to industrial charm—all supporting the classic handmade rugs that adorn the floors. These are historic tidbits mixed with contemporary room settings that you will not want to miss! Anaheim — Across the globe, many of us are partaking in not only buying handmade items but in making our own. Whether as a hobbyist or as a designer, bringing in the handmade touch to products is a continuing trend that is not going away. There are many options available for pursuing the crafty side of life, even in today’s technology saturated world. A visit to the 2014 Craft and Hobby Association Show confirmed this. 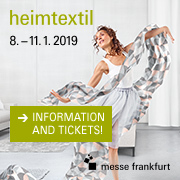 Frankfurt — For the second year running the ‘Young Creations Award: Upcycling’, which focuses on the principle of sustainability, was presented at Heimtextil. The assignment was to create an indoor or outdoor design that repurposes waste products and gives an added value to users different from the original intent. The creations had to be (i) of used textiles, or (ii) of used materials atypical for home furnishings that were given a new purpose in interior design through upcycling. Paris — This week’s newsletter takes a look at the Ateliers d’Art de France and their participation in outlining some trends at Maison&Objet. The theme this time is ‘Territories of Creation’ and it encapsulates the wide-ranging talent of the artisans and their multiple product categories in time-right application. You will notice that there is a strong parallel to the directions presented by the Maison&Objet Observatory. Subscribers can view over 65 images from the four directions here. Cologne — Take a stroll along Trend Avenue at LivingInteriors. 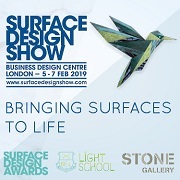 The event, which is held alongside imm cologne every other year, created a venue, staged in collaboration with the German Design Council, cutting directly down the middle of the hall to present the trends in bathrooms, flooring, wallcoverings, and lighting. In tune with the Association of the German Wallpaper Industry, subscribers can take a stroll within. Multiple Turkish Cities — This week’s newsletter and gallery is abundant in influences of travel and multicultural richness. It features the trends developed by Lobster Concepts for UTIB under the 2014/15 theme: Conversation. Subscribers can login to read more about the various fabrics and motifs, as well as to discover key words and the color stories with Pantone color references.